Animals that consume a narrow diet are much more vulnerable than those eat a varied diet. While the honey bee derives its nutrition from many flower sources, the larvae of another insect, the monarch butterfly, relies solely upon one, the milkweed plant. 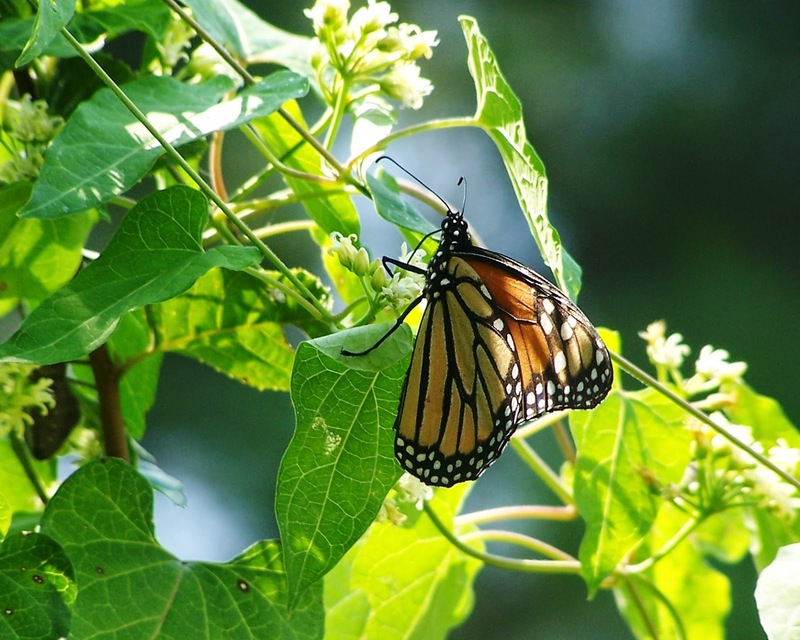 Recent years have seen dramatic declines in the number of monarch butterflies. Robert F. Kennedy Jr. writes in the Chicago Tribune, http://www.chicagotribune.com/news/opinion/commentary/ct-monarch-butterfly-herbicide-kennedy-perspec-102-20141021-story.html, that this past summer he saw no monarch butterflies in an area where he saw hundreds per day in previous years. Kennedy explains that scientists blame the loss of monarch butterflies in part on deforestation in Mexico, drought, climate change. However, the greatest cause of this migrating butterfly’s disappearance is the widespread use of the herbicide glyphosate, first marketed by Monsanto as Roundup. When Monsanto introduced “Roundup Ready” corn and soybeans in the late 1990s, farmers started spraying agricultural fields with the herbicide to kill everything except the desired crop. As a result of this change in farming practice, milkweed has been largely eliminated from much of America’s crop lands. To combat the loss of the monarch’s food, Kennedy suggests that we plant milkweed to create a “butterfly highway” along the monarch’s migratory route from the U.S. and Canada to Mexico. These plantings fit in nicely with efforts to help save bees, butterflies, and other at-risk pollinators. The monarch’s treacherous migration of 2500 miles involves several generations. Butterflies east of the Rockies fly to Mexico to spend the winter, and monarchs west of the Rockies winter in California. The Arkansas Democrat Gazette illustrates their migration route through Arkansas at http://www.arkansasonline.com/news/2014/oct/25/milkweed-and-monarchs-20141025/. Those wanting to provide milkweed for the passing butterflies can find sources of seed from the Xerces Society at http://www.xerces.org/milkweed-seed-finder/. The monarch, considered by some as the most beautiful insect may respond to plantings of its required food in pollinator gardens. With flowers added, these gardens are important food plots for honey bees and native pollinators as well. The health and productivity of any bee colony is dependent upon the condition of its queen. A productive queen that lays a large number of eggs per day usually produces a large population of bees capable of maintaining a healthy hive environment while managing many bee hive pests. 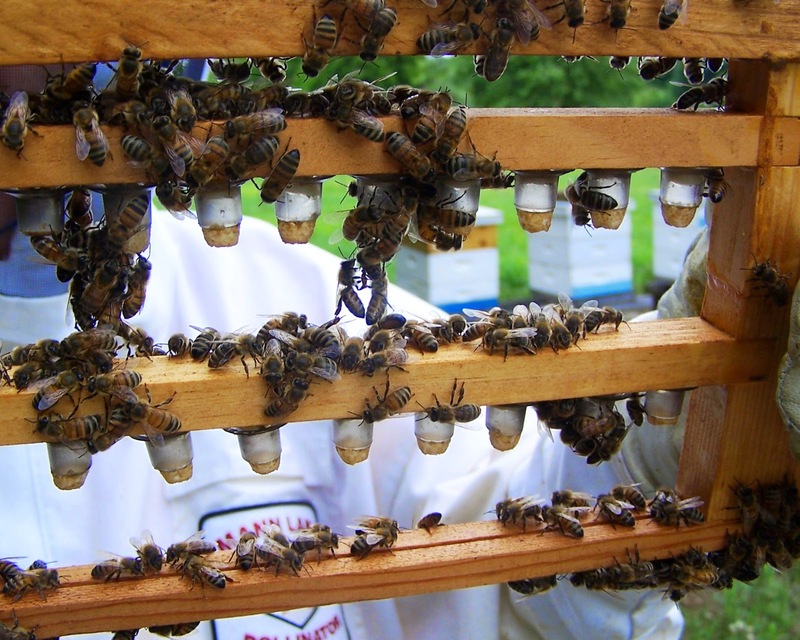 Managing queen bees has always been at the center of beekeeping. To maintain honey bee colonies, beekeepers must be able to produce queen bees as needed. However, only honey bees can produce queen bees. For beekeepers to encourage bees to produce queens, they have to simulate the conditions in which bees naturally produce queens on their own. Honey bees will produce queens when the colony has lost its queen or when they are replacing a failing queen through supersedure or when they are preparing to swarm. 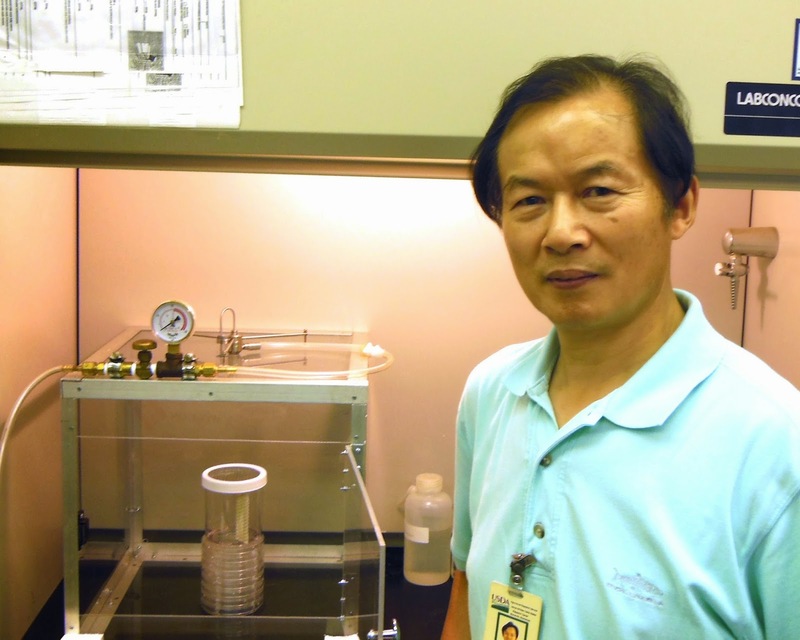 The beekeeper can produce some queens by simulating the hive conditions that lead the bees toward producing queens. 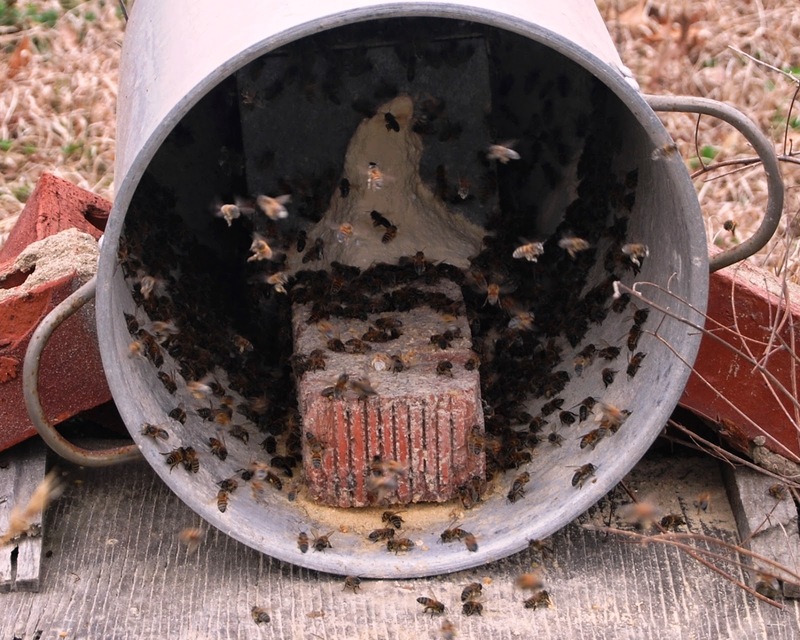 One commonly used method uses a starter and a finisher hive to produce a number of queen bees. Bees produce new queens in the spring when the colony is crowded with young bees, queenless, and well fed. 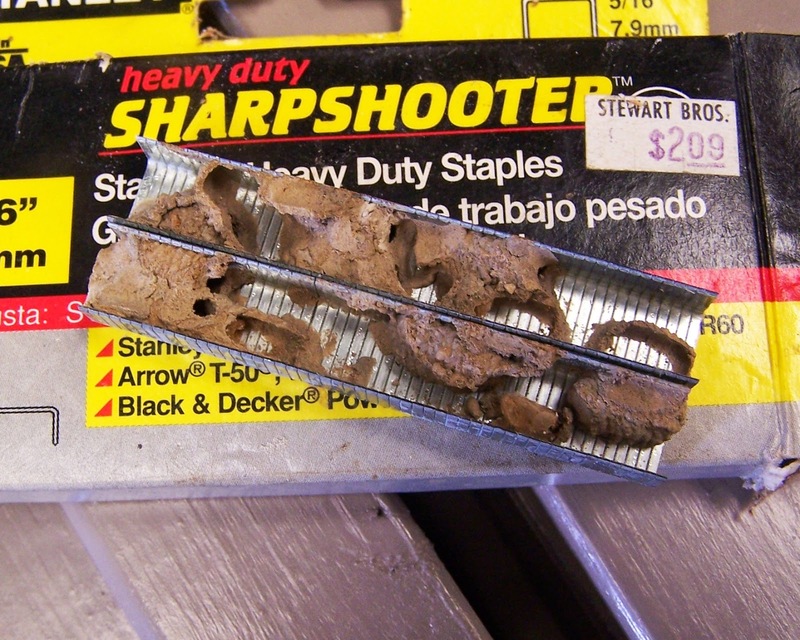 These are the conditions used in a starter hive to accept grafted larvae. Queens can be produced by grafting very young larvae during the first 12 hours of the larval stage. The queen cells in today’s photo have been cared for by the bees in a queenless starter hive for one day. During this time, the bees have begun drawing down the beeswax cell to house the developing queen, and they have begun feeding the larvae large amounts of royal jelly which will cause the larvae to develop into queen bees. After this first day’s development, the queen cells are moved to a queenright finisher hive to continue their development. Nurse bees in the finisher hive continue to feed the developing queen royal jelly while other workers extend the queen cell downward. Twelve days after grafting, a virgin queen emerges. The President signed a Memorandum Creating a Federal Strategy to Promote the Health of Honey Bees and Other Pollinators, http://www.whitehouse.gov/the-press-office/2014/06/20/presidential-memorandum-creating-federal-strategy-promote-health-honey-b. 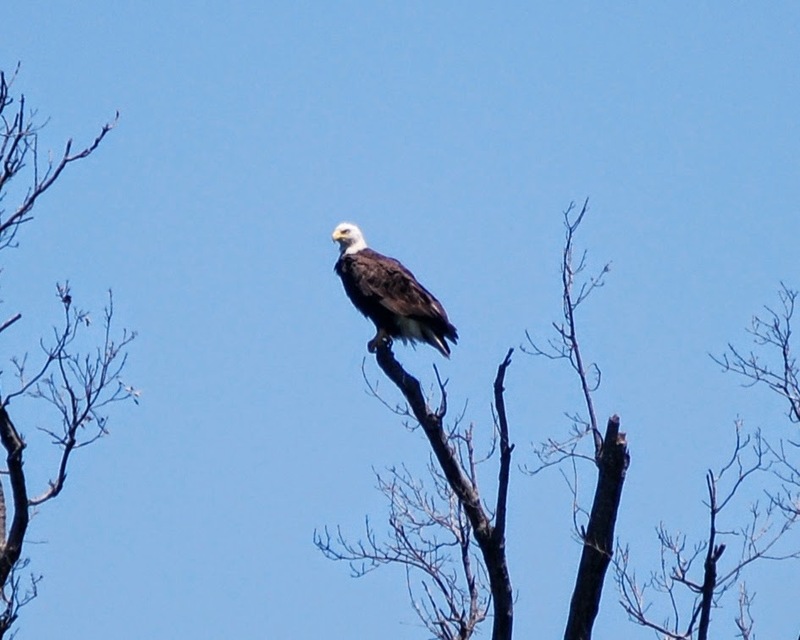 The memorandum directs several departments of the federal government to immediately address issues leading to the loss of honey bees and native pollinators. The memorandum speaks clearly of the need for action: “Pollinators contribute substantially to the economy of the United States and are vital to keeping fruits, nuts, and vegetables in our diets. Honey bee pollination alone adds more than $15 billion in value to agricultural crops each year in the United States. Over the past few decades, there has been a significant loss of pollinators, including honey bees, native bees, birds, bats, and butterflies, from the environment. The problem is serious and requires immediate attention to ensure the sustainability of our food production systems, avoid additional economic impact on the agricultural sector, and protect the health of the environment.” Honey bee losses have been clearly recorded, but the losses of other pollinators are more difficult to assess. Bumble bees live underground, and many native bees nest in foliage, often unseen. Monarch butterflies, often viewed as indicators of the health of the environment, reached their lowest recorded population level this year, and their migration is considered to be in danger of failing. 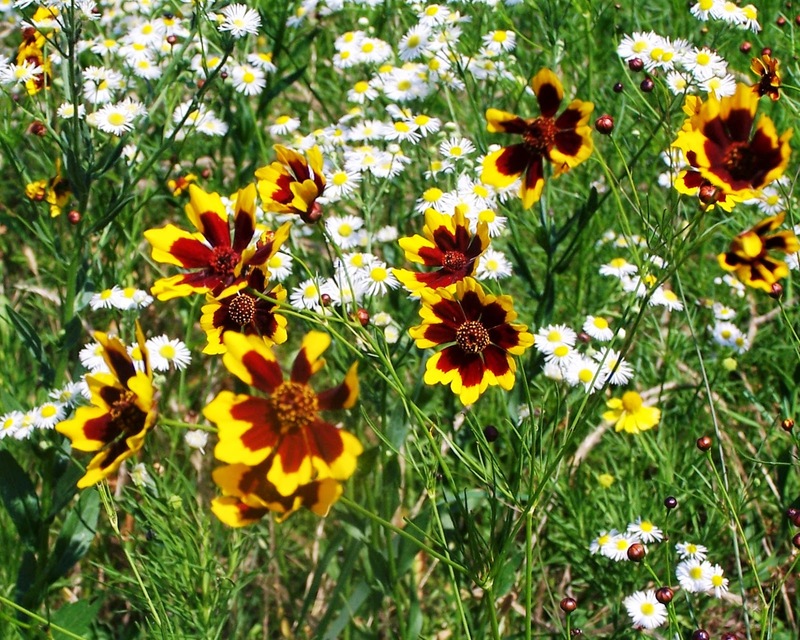 Among the action plans presented in the memorandum are the development of affordable seed mixes of native pollinator-friendly plants for honey bees and other pollinators, finding best management practices for reducing pollinator exposure to pesticides, restoring and enhancing pollinator habitat along road, power line, pipeline, and utility rights-of-way and federal lands. In one example of the efforts described in the memorandum the Departments of Agriculture and Interior will establish a reserve of native seed mixes for habitat rehabilitation after fires. 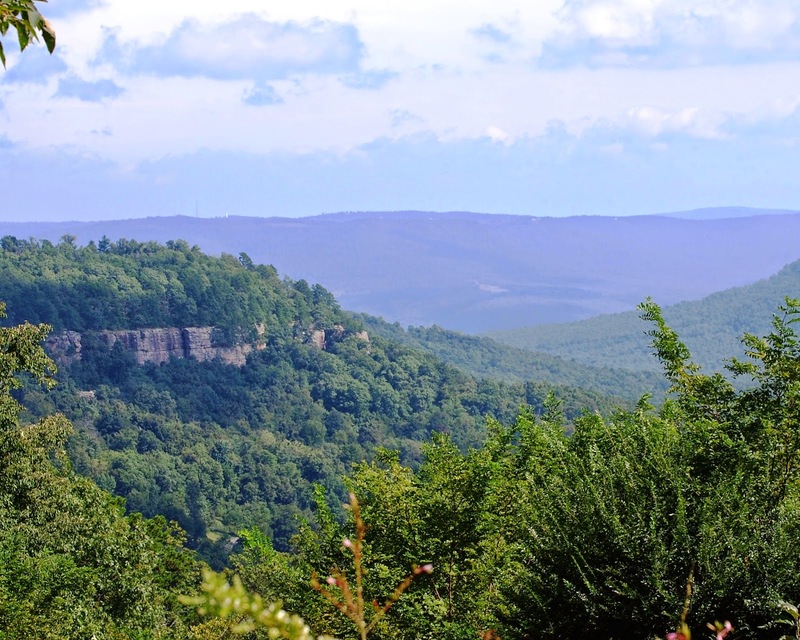 The memorandum moves us closer to seeing our cities connected by flowering pollinator corridors along the interstate highways. Today’s photo: native Blue Orchard Bees find a nest in a package of staples in Peace Bee Farm’s woodshop. Beekeepers have long suspected the role of the neonicotinoid insecticides in the great upsurge of honey bee colony die-offs that have continued since 2006. Named Colony Collapse Disorder, the loss of honey bee colonies has persisted for eight years in spite of efforts by researchers to identify a cause and by beekeepers to replenish their hive numbers. According to the Bee Informed Partnership’s recently released report, http://beeinformed.org/2014/05/colony-loss-2013-2014/, annual losses have averaged an unsustainable level of nearly 30 percent. A relatively small-scale study by Harvard School of Public Health, http://www.bulletinofinsectology.org/pdfarticles/vol67-2014-125-130lu.pdf, reveals interesting findings. 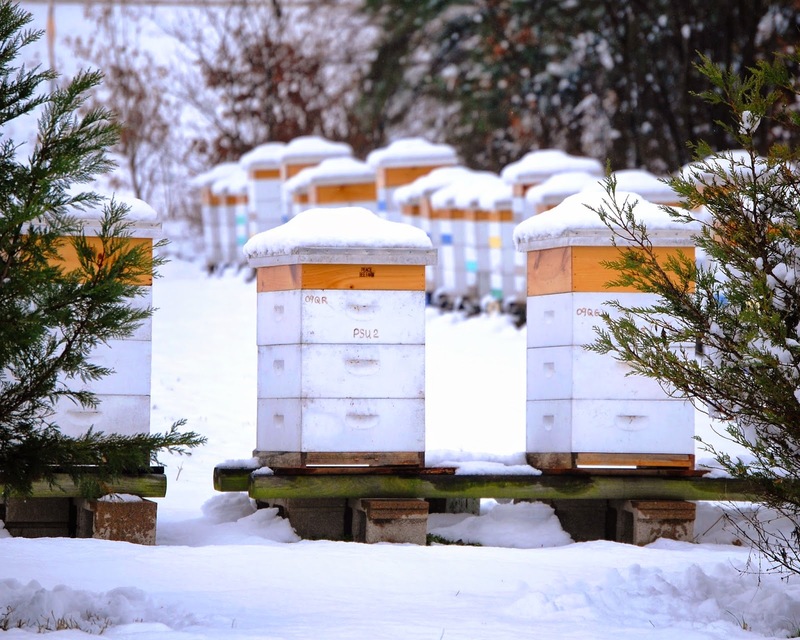 Honey bee colonies exposed to either of two low levels of neonicotinoid insecticides, imidacloprid or clothianidin, abandoned their hives during the winter, defining symptoms of Colony Collapse Disorder. This report contrasts somewhat from the results of a previous study on the effect of pesticides that lead to susceptibility to the honey bee gut pathogen, Nosema ceranae. The larger study, reported in PLOS ONE, http://www.plosone.org/article/info%3Adoi%2F10.1371%2Fjournal.pone.0070182#authcontrib, finds large numbers and high levels of pesticides in honey bee hives. The researchers found 35 different pesticides in sampled honey bee pollen and high levels of fungicides. Until recently, fungicides, chemicals designed to fight fungal infections, were considered safe for honey bees. Recent studies are finding fungicides to have an adverse effect on honey bee health, often making insecticides and miticides more toxic to bees. In the PLOS ONE study, fungicides were found to lead to Nosema infection. Needless to say, the search for the cause of Colony Collapse Disorder has revealed the complexity of the problem. There are many factors contributing to honey bee health, including nutrition, parasitic mites, pest insects, viral, fungal, and bacterial diseases, and environmental chemicals. 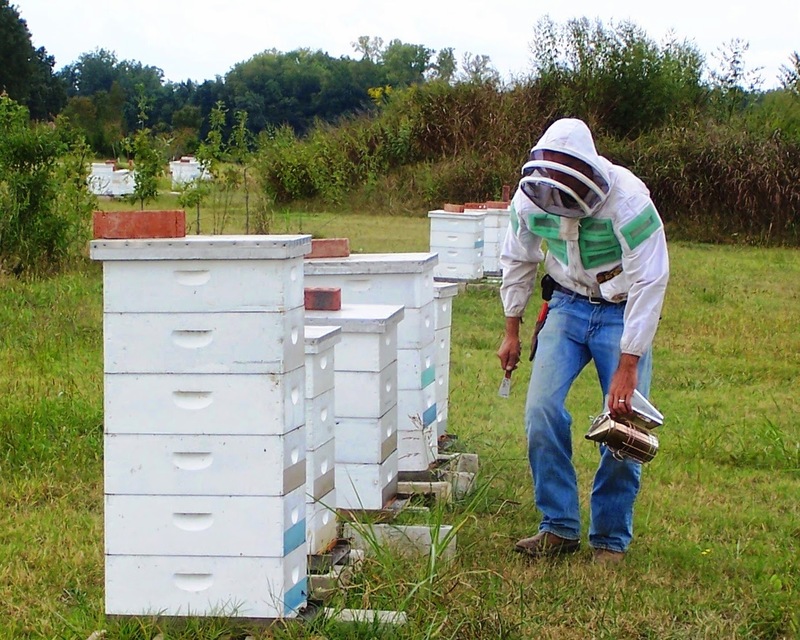 Studies are finding insecticides, miticides, fungicides, and herbicides in the bee hives. Combinations of chemicals and breakdown products of chemicals are often highly toxic to bees. 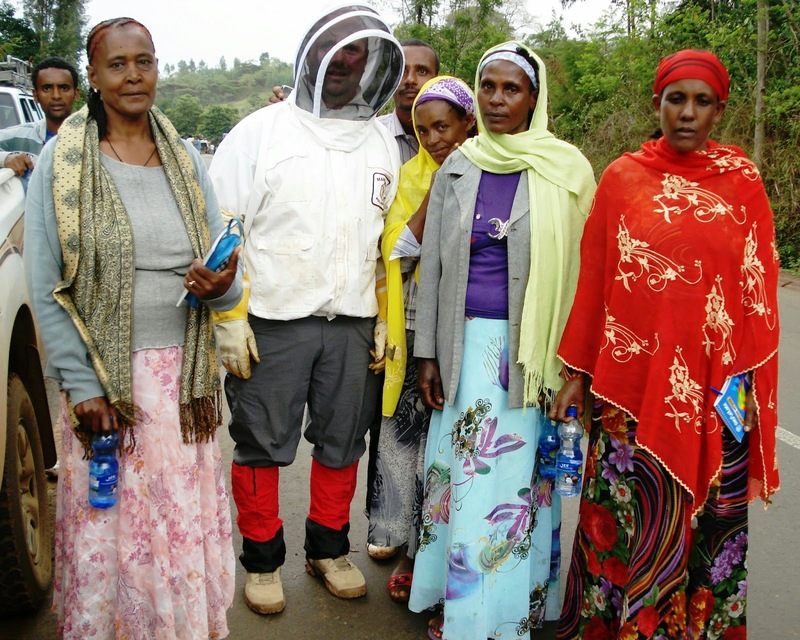 Peace Bee Farm has participated in a number of the studies. 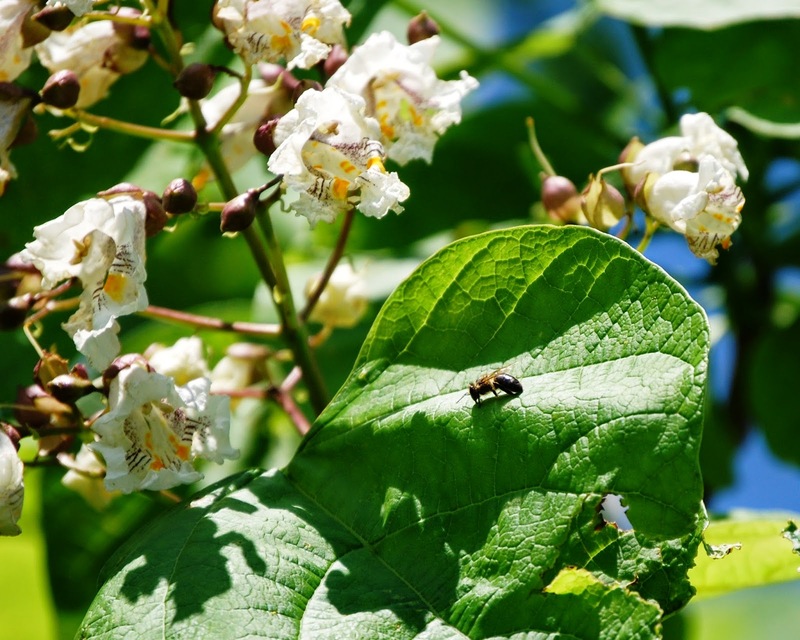 Today, catalpa trees secrete nectar from the flowers and nectaries on the leaves.